The month of November in Rocky Mountain National Park is a quiet time of transition. The Elk rut is over, the beautiful golden colors of autumn have passed, but oftentimes the heavy snows of a long winter have not yet fallen on RMNP. The grasses in the meadows and parks of Rocky Mountain National Park are golden brown and streams such as the Big Thompson have not yet frozen over with ice. The shorter November days can produce some dramatic sunrises like this one I photographed in Moraine Park. 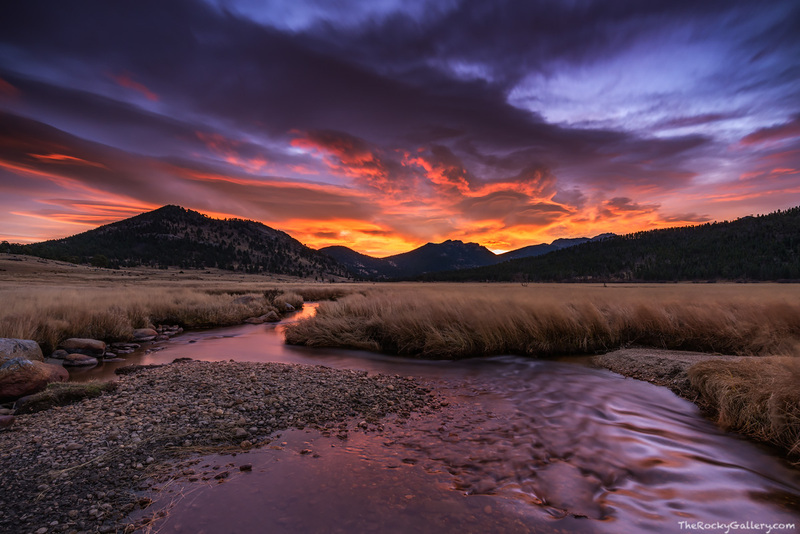 With the Big Thompson River winding its ways through Moraine Park and towards Eagle Cliff Mountain, in only a short distance the river will exit the borders of Rocky Mountain National Park. Photo © copyright by Thomas Mangan.